DETROIT (AP) The Boston Celtics prevented Andre Drummond from scoring in the paint and quieted Reggie Jackson on the perimeter. When Detroit beat the Celtics last month, Drummond scored 26 points and Jackson had 20. In the rematch, Drummond didn’t make a shot until late in the game and finished with just six points on 1-of-5 shooting while Jackson was 0 for 9 with two points. Boston shut down the Pistons’ offense after giving up a season-high 118 points on 52 percent shooting in the loss to them. On Sunday, the Celtics held Detroit to a season low in points and forced it to miss two-thirds of its shots. Celtics: Marcus Morris, who was acquired in last summer’s trade with Detroit for Bradley, didn’t play and is expected to sit out the next game before having his left knee evaluated in Boston. 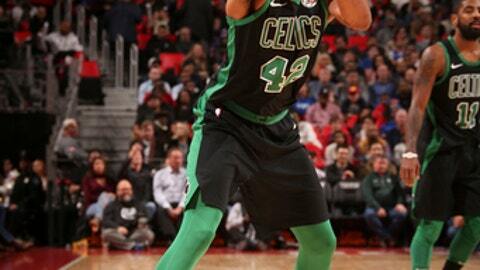 … Horford left the game briefly in the first half, favoring his right leg as he limped off the court. ”I just banged knees,” Horford said.